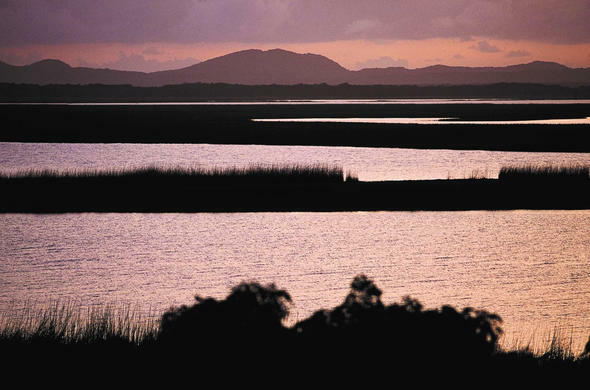 The Greater St Lucia Wetlands Park was the first area in KwaZulu-Natal to be awarded World Heritage status. It extends along a vast section of the northern coastline stretching from Mapelane Nature Reserve to Kosi Bay on the Mozambique border and extending 5 kilometres into the ocean. This magnificent World Heritage site protects magnificent beaches, aquatic life and coral reefs as well as a patchwork of vegetated dune forests, lake systems, estuaries, swamps, bushveld and riverine forests with all its resident wild fauna.Lake St Lucia is Africa's largest estuarine system. It is a unique lake that stretches for an expansive 38 000 hectares offering some of the most diverse wildlife and outdoor experiences in the country. St Lucia is famous for its birdlife - especially the thousands of waterbirds that gather here.The lake supports an enormous population of Crocodile and Hippo, and there are also Rhino, Buffalo, Waterbuck, Impala, Nyala, Kudu and a host of other wild animals. An exciting addition is Elephant, which have recently been reintroduced to the Park.Migrant humpback Whales, Dolphins and an incredible variety of fish can be seen along the coastline and there are guided tours to see the ancient breeding cycle of endangered leatherback and loggerhead turtles.Certain areas of the Park have been opened for recreation and Mission Rocks, 16km north of the St Lucia estuary has the most wonderful rock pools and a dune-top lookout point from where you can see for miles across the lake, the eastern shores and out to sea. Cape Vidal is popular for sport fishing and snorkeling and the golden beaches and surrounding coastal forests is ideal for hiking.There are a number of self-guided trails throughout the area. Ski-boating, surf-angling and safe swimming are popular at Mapelane on the south bank of the Mfolozi River mouth and False Bay Park, Fanies' Island and Charter's Creek are all popular fishing spots with excellent rest camps and campsites.Facilities include fishing jetties and boat moorings and some places also have a swimming pool and laundry. Guided tours on a launch depart daily to explore the estuary and an excellent Crocodile Centre is situated near to the entrance of the busy town of St Lucia where there is a variety of accommodation options.Other activities in the Park include scuba-diving, for which Sodwana Bay is world famous and there are also wilderness trails, horse riding, boat hire, mountain biking and canoeing. This is a medium risk malaria area.